Law firm Freeman Fisher has expanded its commercial litigation team with the appointment of Louise Goodwin as an associate. Louise has joined from DAC Beachcroft, where she was a senior solicitor and previously worked with Alex Megaw, managing partner at Freeman Fisher. Meanwhile, James Brown has moved from Addleshaw Goddard to become Freeman Fisher’s first trainee solicitor. He was a paralegal at Addleshaw Goddard, where he worked with Krista Powell before she left to launch Freeman Fisher’s real estate department in January. 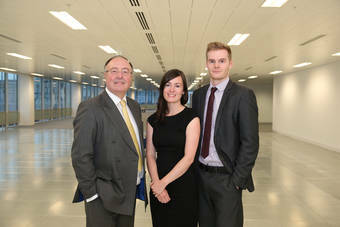 James and Louise are based at Freeman Fisher’s offices in Spinningfields, Manchester. “We are continually looking to expand our offering by recruiting quality personnel into key positions. Louise fits the requirements of the demanding role of associate in our busy commercial litigation practice, and I am delighted to welcome her to the Freeman Fisher team. Louise has extensive experience of advising on a wide range of commercial disputes and has previously acted for clients including NHS bodies, a Premier League football club, UK-based and international businesses. Mr Megaw co-founded Freeman Fisher last year with Gary Black. The practice advises on insolvency, corporate and commercial matters as well as commercial litigation and real estate.